Krystyna Skarbek was Britain’s first female special agent of WW2. 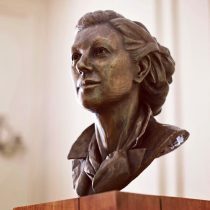 This memorial to her was commissioned by Ognisko Polskie, the Polish Hearth Club, London. The world’s first beachball orrery, a working model of the solar system which includes many different sized, illuminated beach balls, the biggest over a metre across. 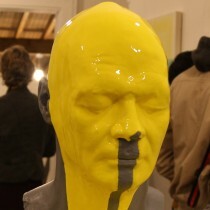 Revolver began as a creative means of simultaneously constructing and destroying, of casting and melting, a human head. 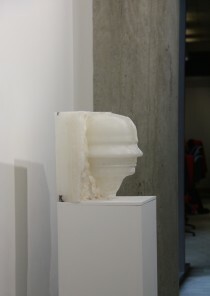 A continuous profile mould inspired by Renato Bertelli’s ‘Head of Mussolini’ was used to produce a wax positive suggestive of a head carved out of a rough block of alabaster or marble.